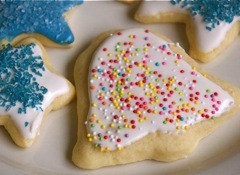 TheWanderer: Ethyl's Frosted Sugar Cookies for Christmas! We made these in 12 dozen batches during the Holiday season, they didn't last long! A Facebook acquaintance was looking for a recipe for roll out sugar cookies you cut out and frost. bake at 400 for 6 to 8 minutes. Mix powdered sugar and margarine. Still in vanilla and milk, beating until frosting is smooth and spreading consistency.